It all started earlier in the week. On Thursday I saw Clay by the swing set, talking quietly to himself, as I walked to the backdoor on my way home from work. He usually is at the gate—if he is in the backyard—when I pull in the driveway, but I didn’t think much of it. After getting changed, I headed out to fire up the barbecue for dinner. Clay was still over by the swings. It was unlike him to not be in and out of the kitchen when dinner was being prepared, making us a little suspicious. When I started cooking, and he was still over there, I got worried. He follows me like a lost puppy when I am barbecuing, closely monitoring the progress of his dinner, so something didn’t seem right. I jogged across the lawn to investigate. It was a good thing I did. He had been spinning in circles with the swing under his arms and had managed to wrap himself so tightly with the swing ropes he couldn’t get out. Like Houdini in a straight jacket. 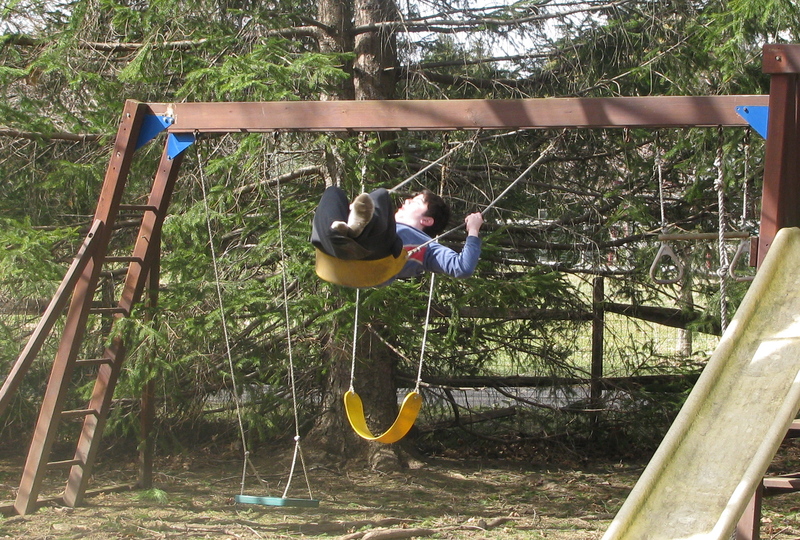 He didn’t seem too worried, so I slowly spun him around until the yellow swing seat, which was pressed against his back, was loose enough to lift over his head. He came back to the patio, and we cooked dinner. Incident forgotten. Until he did the same thing later that night, and my wife had to rescue him. On Saturday afternoon, as I sprinted across the lawn to where my wife was standing, I could see he had gotten himself in a fix. The swing was wrapped so tightly around his chest that he was having trouble breathing. I’m not sure whose face was redder, my wife’s or Clay’s. We tried spinning him to the right to loosen it, but it only seemed to get tighter. We spun him to the left, and it seemed to get tighter, as well. Clay was starting to panic. So was my wife. I had a flashback to a time a few years earlier when, on a six-hour drive back from my niece’s graduation, the little guy had managed to twist his seatbelt so tightly that we couldn’t release it. I had found a bread knife in the back of the car and cut the seatbelt above the shoulder. Houdini was free. Clearly, similar action was needed. I ran to the garage, where I knew a saw was on one of the shelves. It took a couple of tries. The swing rope was strong and tight, the saw dull, but I managed to saw through and release Clay. He went quickly into the house. dropped onto the living room sofa and pulled the covers over his head. “so scared,” he typed a bit later, when my wife asked how he was doing. Needless to say, we quickly decided the swing set had become a safety hazard. It was 25-years-old. Full of memories. We inherited it from my brother when his kids grew out of it. I spent a long weekend a few years back disassembling at his house, hauling it home and reassembling it at ours, adding a fresh coat of stain. Clay swings with gusto, and he pushed that swing beyond its normal capacity for a lot of years. At times, the whole set would rock with him. My older son spent many evenings sitting on the swing in the dark, listening to music on his headphones, enjoying the oasis away from the chaos in the house. But, lately, it was leaning to the right and moaned loudly when anyone used it. A tired, old friend with aching bones. The next morning, my older son and I went out armed with a screwdriver, pliers, a sledgehammer, an axe and a socket-wrench determined to put it out of its misery. Our personal Old Yeller. We unscrewed what we could, ripped apart what we couldn’t unscrew and used the ax and sledgehammer on everything else. 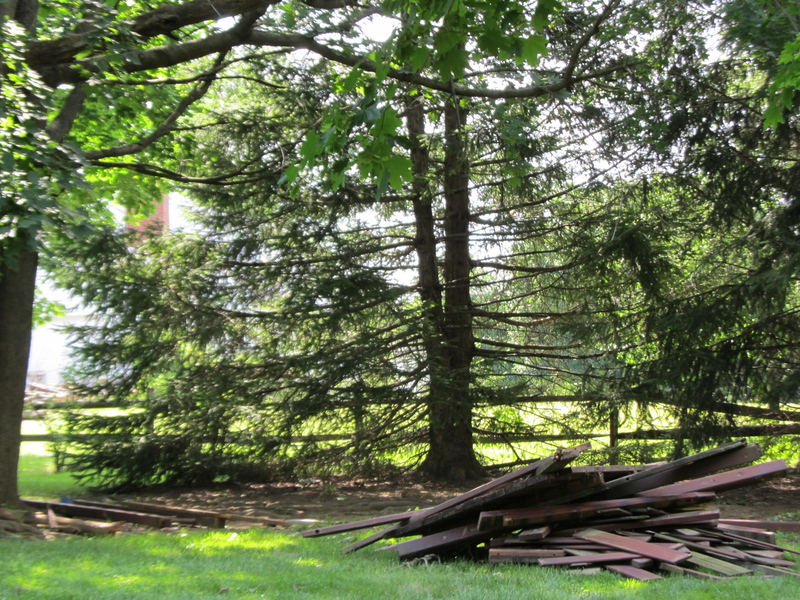 In about two hours, it was a pile of rubble, and we were already anticipating sore arms and backs when we woke up. 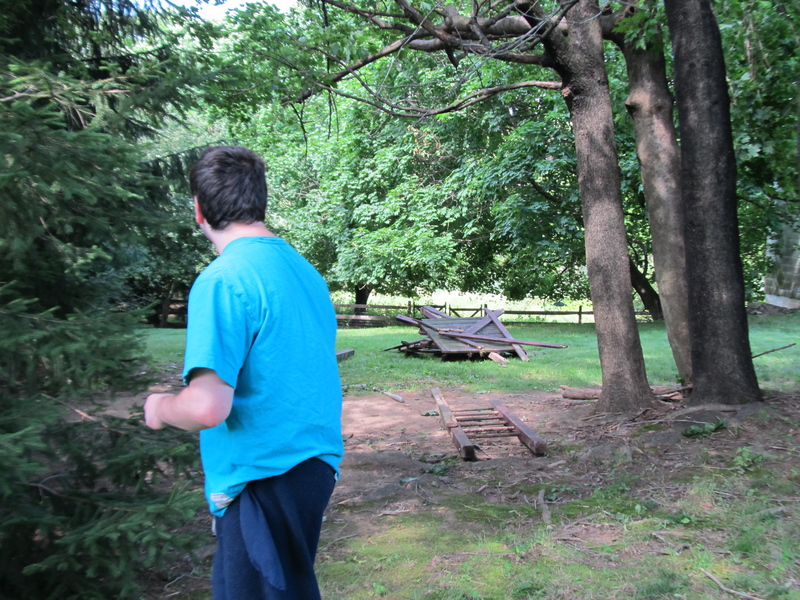 Clay came out to investigate while we were removing the swing set (walking away with the hammer) and to inspect the grounds afterwards. Later, my wife checked in with his iPad to see what the little guy was thinking. “Let ‘s talk about the swing,” she said. So, we are in the market for a new swing. This time, one that he can’t get twisted up in. This entry was posted on June 4, 2012, 10:04 am and is filed under Communicating, Daily Life, Silly Behaviors. You can follow any responses to this entry through RSS 2.0. You can leave a response, or trackback from your own site. Glad you are handy around swings. You never can tell what children will do to amuse themselves. You get the father of the year award for your expertise and quick thinking. I can only imagine the panic (which you cannot display) when Clay was wrapped so tight. I couldn’t read fast enough to be sure he was alright. An early Happy Father’s Day, Larry. Sending regards, Roe.